i have a long bruise on my thumb because some idiot scraped a hoof pick down it. (spoiler alert... it was me!) i can't believe i did that... i especially can't believe i've done it multiple times :) i've determined that a job involving hammering nails is not something i want to pursue since i miss something as a big as hoof and hit my hand instead! 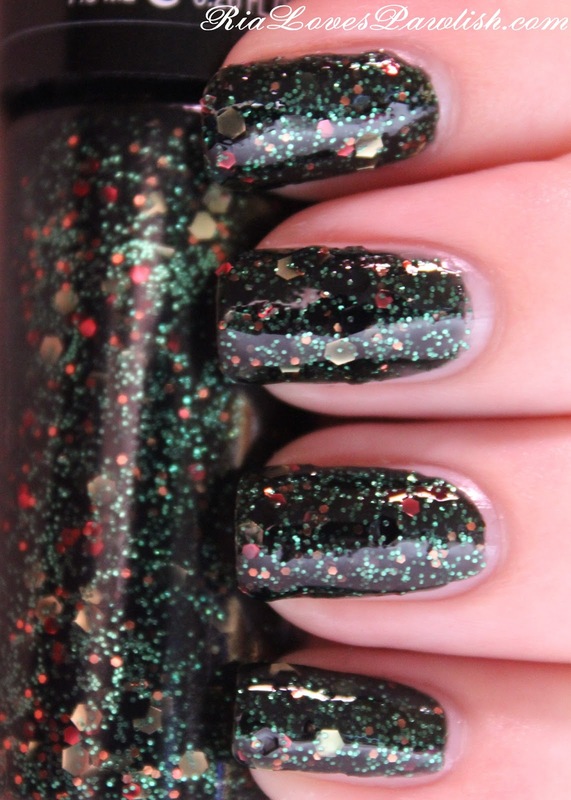 today's polish is Hard Candy Fun N' Festive from their Crystal Confetti collection (it was kindly sent to me for review!). it's a medium sheer green base full of large gold hex pieces, multiple sizes of red pieces, and loads of green micro-glitter. the glitter spreads out pretty evenly on the nail, the only trouble i had with it was a couple pieces that wanted to hang off the tips or stay too far at the base of the nail. these were easily pushed back into place, though! i was pleasantly surprised by how easily this polish built up to full opacity in only two coats! it dries a bit dull, so you'll definitely want to add a shine topcoat to the finished look. two coats Fun N' Festive, one coat Seche Vite. Hard Candy nail lacquers are available exclusively at Walmart and retail for $3.97 for .26 fl. oz. check out www.HardCandy.com for more information on all Hard Candy products!